edit: I found a host to get a domain name registered & get web hosting for only $2.78 a month! It has everything needed to run the site. I’m not sure how soon I’ll be able to purchase it and get it ready, but you can expect it sometime in the future! 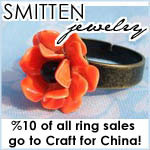 I really want to register craftforchina.com and make a proper site for our fundraiser. I like wordpress, and will keep using it, but the free services are very limited. If anyone has any connections and can get some super cheap web hosting please let me know. All I really need is PHP 4.2 or higher and My SQL 4 or higher. Hopefully in the next few weeks we’ll have a proper site! it’s not “dot com”, but try to check if it might be the kind of thing you are looking for. Hi, I just found your blog through a really roundabout way (I was on the Sew, Mama, Sew blog and she linked to the scrap fabric Christmas ornament that you posted on Flickr, and I came here from there), and I just wanted to say that I think this is an incredible thing you’re doing! I added one of your buttons on my blog and will be blogging about this hopefully soon. Brilliant post thanks for sharing extremely helpfull.